Visit all of the best remaining, accessible standard-gauge steam sites. See around 40 SY and JS locos in action. This is a tour for those interested in still and video photography of real steam operations especially of hard working steam-hauled trains in attractive or unusual scenery. It is not a tour for those primarily interested in riding behind steam nor for those who like to see re-creations of how things used to be. What we see on this trip will be 100% real, 100% now and not especially arranged for us. 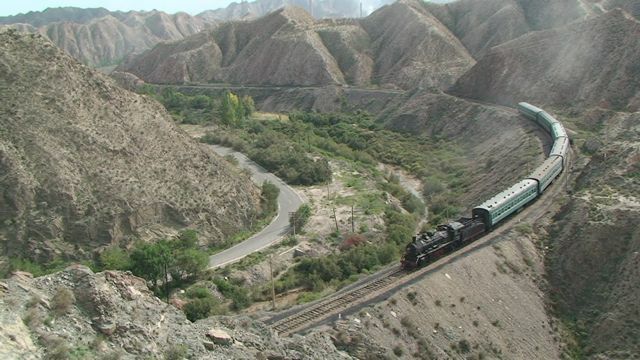 I organise and guide trips within China using experienced local Chinese guides for small groups of individuals who are interested in seeing industrial railways that still operate real steam locomotives daily. China is the last place left in the world where it is possible to see this throughout the year. Should you wish to contact participants on the 2011 tours to get their unbiased opinion about the kind of tours I lead, please contact me and I will put you in touch with one or more of them. Sandaoling has two distinct sides. 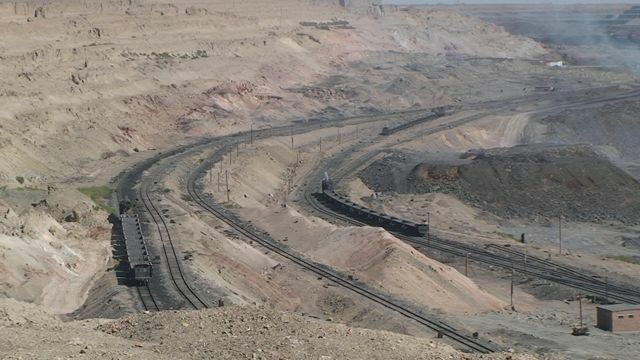 Here we see 3 trains on the spoil extraction side. I have refined my late autumn 2012 trip. This tour has expanded its scope to include all of the best Chinese standard gauge steam lines with visits to Sandaoling, Baiyin, Pingzhuang, Yuanbaoshan, Hongmiao, Fuxin and Fushun. 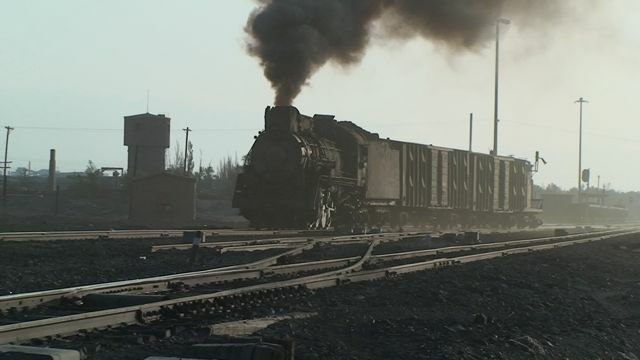 At Baiyin, it is not known if steam will still be used in late 2012 but that could also apply to other places on the trip plan (with Yuanbaoshan probably being the next most vulnerable). Adjustments will be made if necessary in the light of any new information before the trip starts, or even during the tour, as no-one wants to spent more time than necessary at a location that has dieselized. If anyone knows of other steam lines of the same caliber as these that should be included in such a trip, I would be pleased to see if they can be included. Shibanxi is not included on this tour (but click here if that is your main interest). As of 28 August, all of the locations to be visited are still thought to be using steam. 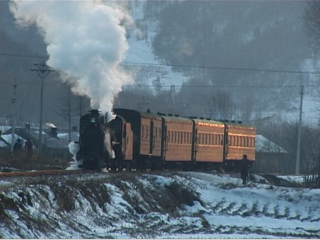 Baiyin is confirmed to be using 1-2 steam locos daily including the passenger train run to Shenbutong. At Sandaoling, 3-4 locos still work coal trains from the pit chimney first (despite comment elsewhere suggesting this had been replaced by road haulage). As many as 13 locos at the west end of the pit on spoil and works trains. 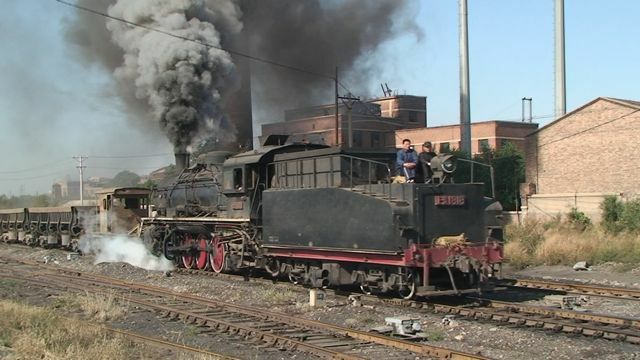 The Yuanbaoshan passenger is still steam (JS). This tour is competitively priced if you take into account the number of days, the travel and the locations involved, and the extras included as standard on my tours such as permissions for access and photography, single rooms, 3 meals a day plus beer with meals and all tips. 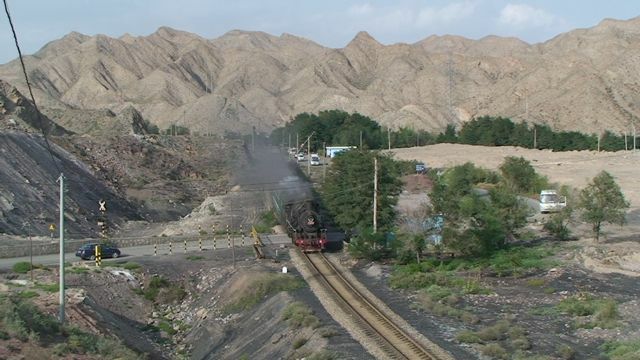 Believe it or not, this is the workers' passenger train at Sandaoling. This tour is planned for 21 October - 11 November. These dates are now fixed as some participants have already booked their flights. Days below are also shown as Day 1, 2, etc. as well to allow a quick count of how many days/nights are involved. 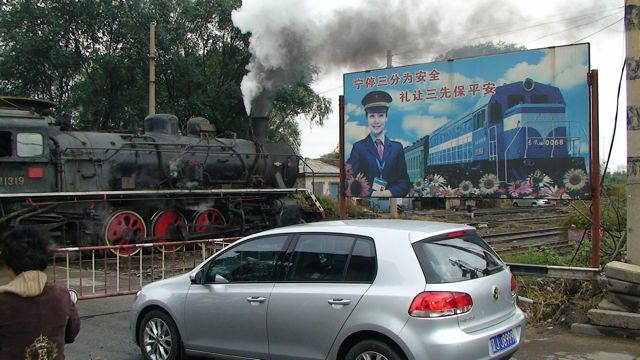 + if Baiyin is 100% diesel, we will return directly from Sandaoling to Beijing (in this case, a visit to see if any steam is left at Yamansu may be on offer if interest is sufficient) and we would arrive back in Beijing on 31 October (overnight Beijing). I am not aware of any other steam alternative to Baiyin on any sensible route back to Beijing at present. It will not be possible to move on to Pingzhuang prior to 1 November (as some people have booked for Part 1 or Part 2 only). * includes Fushun Old Steelworks (6-7 SY working) as long as permission is forthcoming. The tour price is for ground arrangements only with the total calculated with reference to the number of nights with the tour (actually per 24 hrs from 9 am to 9 am next day). Your additional costs will primarily be your return airfare to/from China, your Chinese visa and your Beijing hotel. Other part sections are possible, please ask. + Prices which include Fushun Steelworks are not yet confirmed. The costs of the Fushun steelworks visit if approved may need to be added to the cost. I use oanda.com to check exchange rates. If you select the Interbank +/- 5% (kiosk rate), this should give you a good idea of the exchange rate on offer at Beijing airport. You could also check the Bank of China. This tour is filling nicely but still open for bookings. We can assist you leaving the tour with train or bus tickets or with transport to the airport, train or bus station at cost if you sign up for a part tour. At Fuxin, coal empties head east. Advice and assistance to obtain your Chinese visa and on other matters before the trip starts. Travel by train or private bus. Minimum six people for the whole or any part of the tour to run. This number has been achieved (25 June). To keep everything manageable, this tour is limited to a maximum of 12 people for the whole tour. 1 or 2 extra people may be accepted for small sections of the tour only. The Baiyin passenger train is hanging on a thread. Will it still be steam when we visit? We will be visiting real steam operations. There are no charters or special trains, it's all real. However, as with any real operation, we could experience days when things don't operate as we would like. There is also the chance that these lines could reduce the amount of steam they use by the time of this trip. If joining this tour, you accept this reality. We could also find hotels that have promised single rooms do not have enough rooms for the group or that hard rather than soft class sleepers on overnight trains are all that are available for some or all of the group. We will do what we can to ensure that frustrations and minor discomforts such as these do not happen but we depend on the cooperation of others to ensure that everything goes totally to plan. You sign up for these tours in full knowledge that things don't always go right all the time and accepting that flexibility and compromise may be required by you at times. If single rooms are not available then the decision on sharing arrangements will be made by the organiser. You agree to accept my decision on this. A refund equal to half the price of a single room per night will be paid to anyone who has to share. Although we plan overnight journeys travelling in soft class sleepers on trains this is not always possible and sometimes hard class sleepers may be used. Hard sleepers are a comfortable and pleasant way to travel and are preferred by at least one of my previous participants. In both soft and hard class, people normally prefer lower berths. You agree to accept that class and berth allocation will be at my discretion. Your deposit is fully refundable but only until the tour is declared 'go' and the organisers start to incur costs. Once we incur costs (most likely my airfare and visa fee), you accept that these costs will be split between all those who have signed up and you will receive back your deposit less your share of this. If you cancel two weeks (14 days) prior to the tour start, no refund will be made. In the event that the organisers have to cancel the tour, your deposit will be fully refundable. In the unlikely event that we need to cancel the tour for whatever reason, the limit of our liability will be the full refund of any deposits paid to those who have signed up for the tour. I’ve dropped Shibanxi from this autumn’s tour plans. However, if one or more people would like a Shibanxi visit (along with other steam and narrow gauge lines in Sichuan and Chongqing, perhaps), I would be happy to co-ordinate this with local guide Zebedee. Please see chinatour3.html for details of the sort of tour can can be offered. Let me know if you are interested and I will try to put a small group together and agree the itinerary and the price with you and Zebedee. I can’t promise to be on this tour but I do promise to supervise it to make sure it is designed to meet everyone’s expectations.